Sliding inner roof over the field and one of the very fiew roofs able to lower its height after the World Cup, once the upper tier of seating is removed. 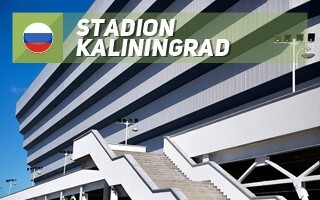 That's what was planned for Kaliningrad back in 2012 and included in the winning concept of Willmotte & Associes. Once actual design work was being carried out by Mostovik in 2013, it was also part of the project. However, Mostovik collapsed as a company in 2013, causing a standstill. To worsen its effect, all of Russia's economy began going down and by 2014 it was certain that such stadium would be far too expensive and not viable for timely delivery ahead of the World Cup. You can see the progression of changes below, beginning with the 2010 concept, then 2012 (Willmotte) and 2013 (Mostovik) and Crocus (2015). 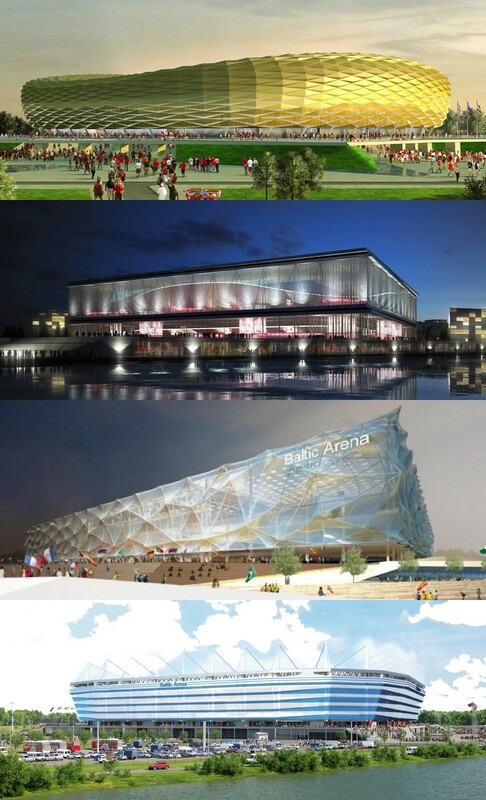 As if that wasn't bad enough, Kaliningrad in 2014 was already the most delayed host-city of the 2018 tournament, to the extent that sports minister suggested changing the stadium's location to an easier site. The one selected by Kaliningrad authorities is part of Oktyabrsky Ostrov (October Island), a swampy and unoccuppied island at the heart of the city. The city decided to stick to it, planning a new microdistrict covering 140 hectares. The stadium plot itself received 24.4 hectares, of which 5.86 ha was dedicated to the stadium itself. Due to growing delays and rapidly falling exchange rate of the rouble, FIFA for the first time in decades agreed to reduce the minimum required capacity from 45,000 to 35,000 (this also happened in Yekaterinburg). The contract for both design and construction was awarded to a joint venture of companies from the Crocus Group, in order to deliver the stadium in shorter time. 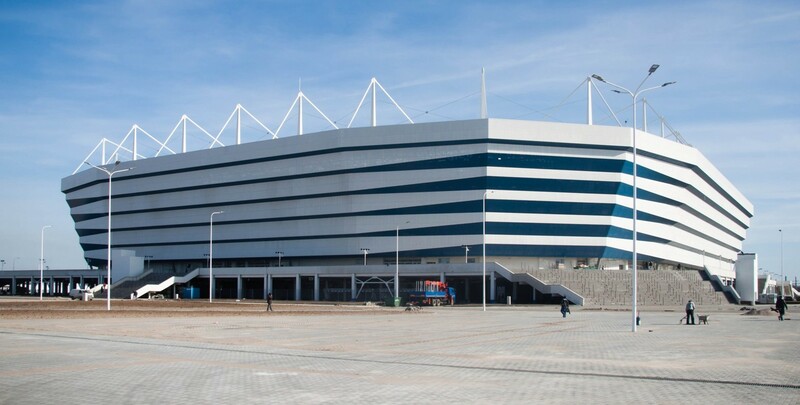 For construction to be as fast as possible, the completely new design of 2015 became Russia's single only stadium to be built almost entirely with prefabricated steel rather than monolithic concrete frame created on site. The outcome of such decision was satisfyingly fast. While in September of 2015 the very first of 7,000 piles was pushed into the ground to strengthen the wetland, just a year later almost all of the primary steel structure was in place. However, that still left little time for further works and eventually the stadium failed to meet its deadline of December, 2017. Permit for use was only granted in late March of 2018. 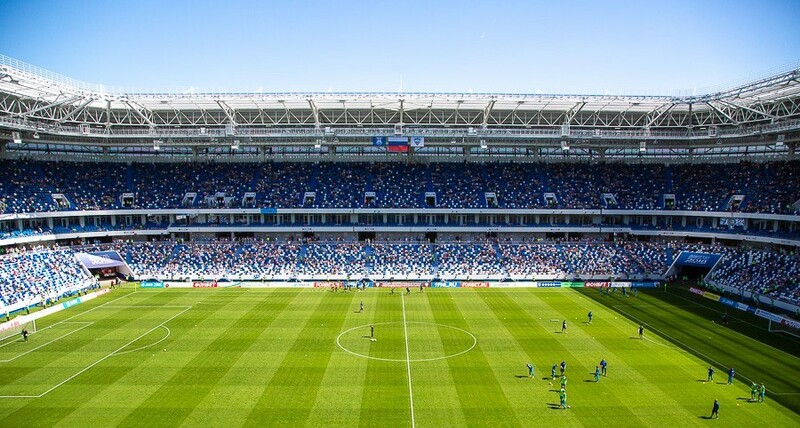 The stadium was downsized and simplified to the extent possible, becoming the second smallest in terms of floor space (112,500 m2 is only more than the extremely constrained Yekaterinburg stadium). Aesthetically, nothing is left from the impressive renders by Willmotte and Mostovik. The Crocus vision is conservative, though it has its fans as well. The angular outer form is created with perforated white and blue aluminium panels, which – just like the seating layout – mimic the colours of FK Baltika, Kaliningrad's traditional club. 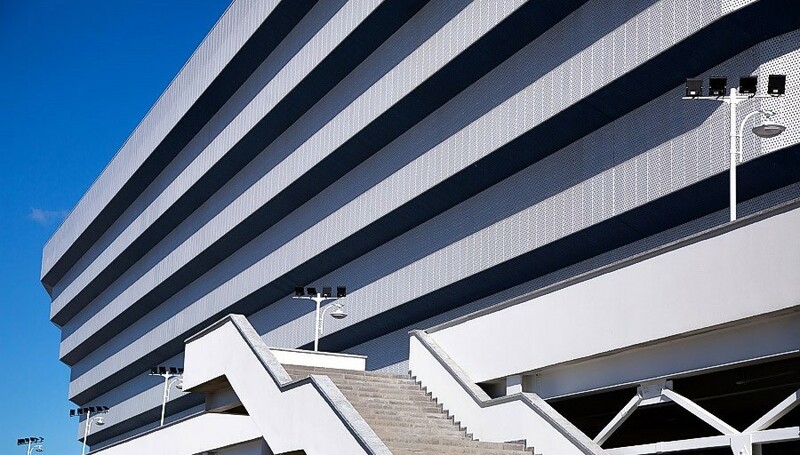 Thanks to the perforations in its facade, the stadium isn't entirely opaque and relies on natural ventilation. The stadium reaches peak height of 47 meters with its 32 pylons supporting the roof. Because the stadium's structure is simple, the idea of downsizing in legacy mode is the one thing which was preserved from 2012 and 2013 concepts. If dismantling of parts of the upper tier goes forward, capacity may be reduced to 25,000. Despite a long list of efforts to limits its cost, the stadium is far from being among the cheapest built for the World Cup in Russia. Its initial budget in 2013 was set at RUB 11 billion, while until the opening it consumed over 18 billion, with further expenses already planned due to hydro-geological issues.